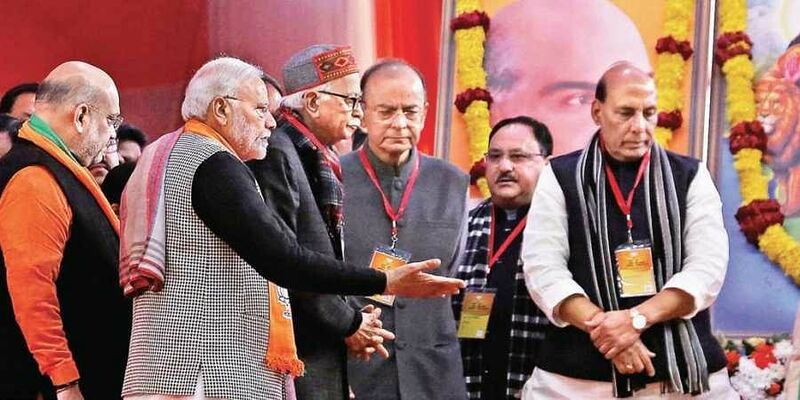 The BJP chief dismissed the proposed grand alliance of opposition parties against the BJP as a "sham", saying they are a disparate group with neither a leader nor any policy. NEW DELHI: BJP chief Amit Shah on Friday drew a parallel between the 1761 Third Battle of Panipat between the Marathas and the Afghans and the upcoming Lok Sabha elections, asking party workers not to be worried about grand opposition alliances. Politics is chemistry, not physics, he said, exuding confidence of repeating the 2014 performance in UP. “Maratha glory was at its peak having won 131 battles before the Third Battle of Panipat. Afterwards, India was enslaved for 200 years. The 2019 election is an ideological battle. It will have consequences for decades, so it has to be won,” Shah said in his inaugural presidential address to the two-day national council meet of the BJP at Ramlila Maidan. Drawing a broader narrative for the upcoming Lok Sabha elections around the 10 per cent quota for the upper castes, tax reliefs to MSMEs and traders, welfare push of the Modi government, development achievements, and reiteration to build the Ram temple at Ayodhya at the earliest after completion of the judicial process, Shah in his 66-minute long speech told the gathering there was nothing to be defensive about. It was his mention of the Ram temple in the middle of his speech that brought the loudest cheer with party workers on their feet hailing it. Shah committed the BJP to building the Ram temple at the earliest, adding expeditious actions would be taken upon the conclusion of judicial process. Incidentally, there was no mention of the party’s recent losses in Rajasthan, Madhya Pradesh, and Chhattisgarh. “Vijay Mallya, Nirav Modi and Mehul Choksi didn’t flee earlier because they were helped by the Congress. Under Modi’s watch, they became fearful and fled,” Shah said, indicating bringing economic fugitives to book would be a major poll plank.